We handle all the details and ensure that your arrangement arrives fresh, on time, and looking beautiful. Each design is tailored with elegance and exceptional style to engage the senses, evoke emotion, and connect ones spirit with nature. To place your order, please call Barber's at 800-386-0039. Available Monday through Friday 8:00am to 5:00pm and Saturday from 8:00am to 12:00pm. This gorgeous bouquet includes purple hydrangea, miniature green hydrangea, green roses, peach roses, peach spray roses, white asiatic lilies, green trick dianthus, dusty miller, pitta negra, and green ivy. This breathtaking bouquet features green hydrangea, pink roses, white roses, pink spray roses, light pink alstroemeria, pink lisianthus, white stock, pitta negra, and seeded eucalyptus. 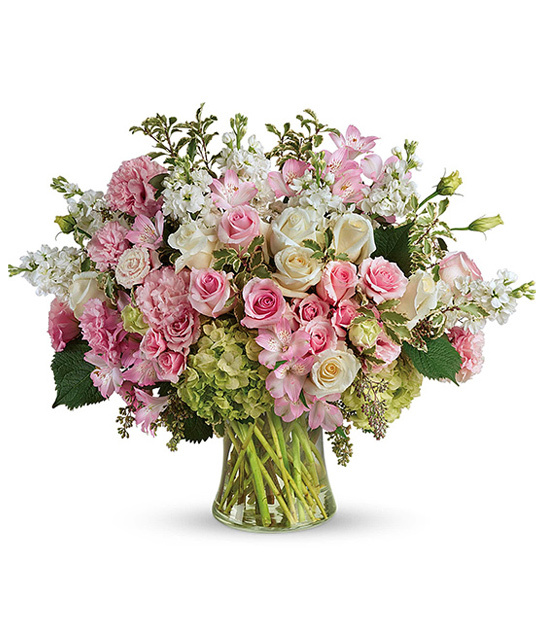 This gorgeous bouquet includes light pink hydrangea, hot pink roses, lavender roses, pink roses, hot pink spray roses, light pink spray roses, pink lisianthus, dusty miller, huckleberry, sword fern, seeded eucalyptus, lemon leaf, and variegated aspidistra leaves. This magnificent bouquet features purple hydrangea, lavender roses, crème spray roses, pink gerberas, lavender carnations, purple stock, lavender cushion spray chrysanthemums, lavender sinuata statice, dusty miller, spiral eucalyptus, seeded eucalyptus, silver dollar eucalyptus, and lemon leaf. 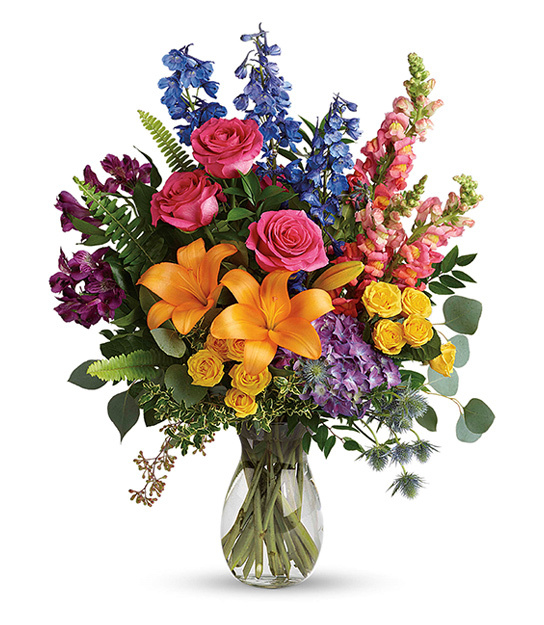 This colorful bouquet includes purple hydrangea, pink roses, yellow spray roses, orange asiatic lilies, purple alstroemeria, blue delphinium, pink snapdragons, blue eryngium, huckleberry, oregonia, Israeli ruscus, sword fern, silver dollar eucalyptus, seeded eucalyptus, and lemon leaf. Light pink hydrangea, pink roses, light pink spray roses, light pink asiatic lilies, pink lisianthus, pink larkspur, light pink snapdragons, and Queen Anne's lace are arranged with Italian ruscus, huckleberry, pitta negra, sword fern, flat fern, and lemon leaf. White hydrangea, white roses, white oriental lilies, white snapdragons, and white stock are arranged with huckleberry, seeded eucalyptus, spiral eucalyptus, green ti leaves, and lemon leaf. 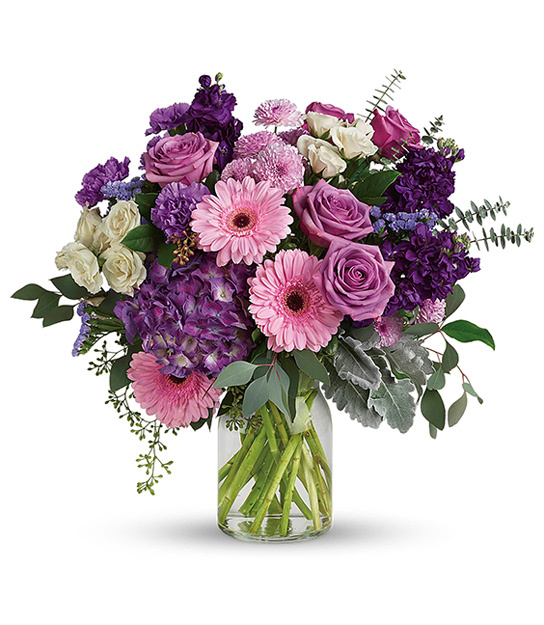 This arrangement features lavender roses, pink spray roses, pink asiatic lilies, lavender carnations, pink larkspur, queen anne's lace, huckleberry, dusty miller, and leatherleaf fern. Two dozen red roses, accented by salal, are presented in a decorative vessel. A beautiful mix of all-American red, white and blue flowers such as hydrangea, roses, miniature carnations, snapdragons, chrysanthemums. A purple phalaenopsis orchid is arranged with natural river rocks and sheet moss. Delivered in a cylinder vase. Available in white or purple. The beautiful spathiphyllum plant will be delivered in a decorative ceramic vessel. (Container Style May Vary). Simply captivating. 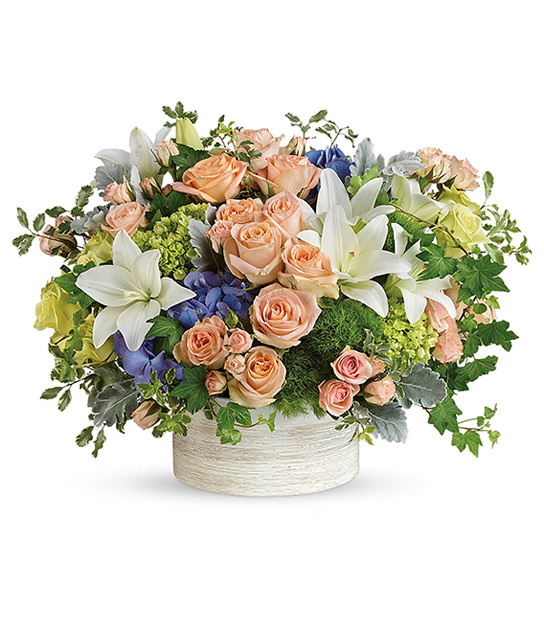 This pretty basket is overflowing with seasonal green and blooming live plants. It's colorful, natural and beautiful. Pothos, nephthytis, dieffenbachia, croton and peperomia plants are perfectly arranged in a distinctive willow rope basket. Eight African violet plants are nestled into a natural basket adorned with ribbons and three butterflies. White and yellow kalanchoes accented with ivy plants fill this charming oval basket adorned with ribbons and three butterflies. 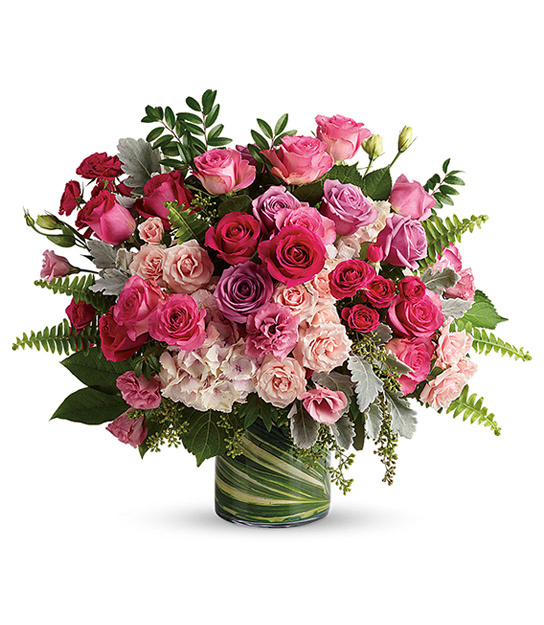 This glorious spray includes pink hydrangea, light pink roses, light pink spray roses, pink oriental lilies, pink carnations, miniature light pink carnations, pink larkspur, pink snapdragons, pink stock, huckleberry, sword fern, asparagus plumosus and greenery. Delivered on a wire easel. A mix of flowers such as peach roses, gerberas and carnations, pink asiatic lilies and lisianthus, purple limonium and lavender larkspur nest in greens on an easel-mounted wreath. Delivered on a wire easel. 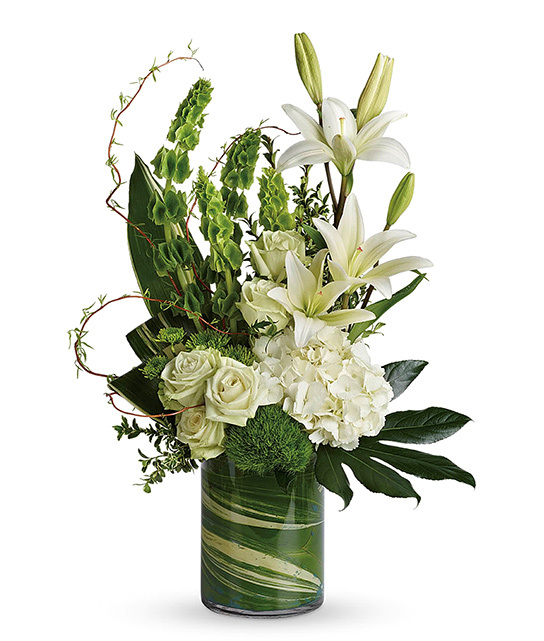 Pure white lilies and dendrobium orchids mingle with red roses, white asiatic lilies and more in this magnificent and impressive standing spray of the finest blooms. A fitting tribute for a memorial service. Delivered on a wire easel. White roses, white carnations, and white asters create a cross that is a beautiful way to honor a loved one. Delivered on a wire easel. This spray features hot pink roses, yellow roses, orange spray roses, pink asiatic lilies, green gladioli, green carnations, medium yellow sunflowers, blue delphinium, bupleurum, myrtle, sword fern, silver dollar eucalyptus, and lemon leaf. Delivered on a wire easel.